Although I still want one bad, anymore I’ll have to wait and see just what the final price will be because it seems that even Kodak employees don’t have a final answer. But if this thing’s gonna cost $2500 I don’t see how I or other students would be able to afford it. The universities should be able to, though…I hope I can borrow one from mine! One good thing in there, it seems that if you’re a fan of developing your own movie film (and I’ve met a few who are), you’re not automatically required to buy processing/scanning with the super 8 cartridge so I see that as a plus. Kodak’s online store has gone back and forth between offering and not offering 16mm and 35mm film, and the price of super 8 film randomly fluctuates, I haven’t seen it advertised at what it should be since summer of 2017. This popped up in my facebook feed this morning. If you needed further proof that Kodak is confident of the future of film, here it is! Honestly I’ve never shot this film so I’m glad I’ll get another chance. 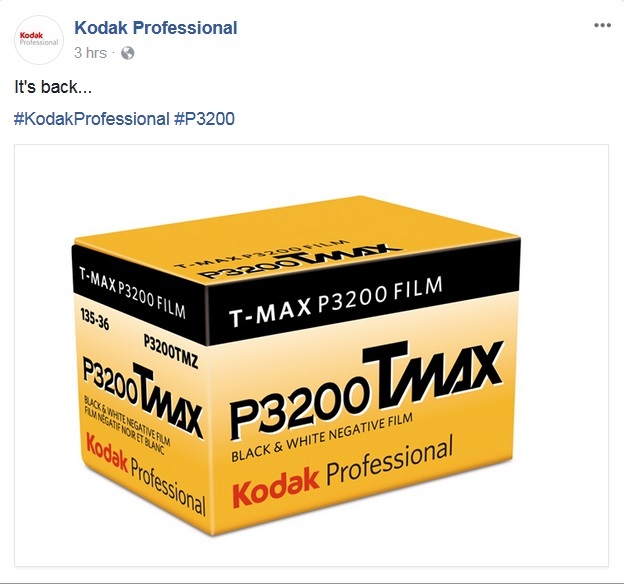 Supposedly it’ll be available in March, which means it’ll beat Ektachrome to market. And there’s part of the problem. edit: They must be really sure of their release date, because all the retailers are accepting preorders! One thing that my instructor in Intermediate and Advanced Photo taught me was to make projects out of what you happen to be doing. Since Summer 2016 I have been dressing up like a cowboy and driving jeep tours around Colorado Springs. Here are some of the shots I’ve gotten when have a free hand (none while moving, I promise). Besides being an ongoing photo project, I’ve also started making a documentary about life as a tour guide, the growing Colorado Springs tourism industry, and how Colorado and the western states differentiate themselves from the rest of America. We’re living in the age where cowboys traded in their horses for jeeps.